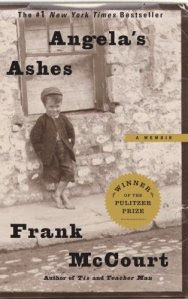 Angela's Ashes, a Pulitzer prize winner, is a book about Frank McCourt's childhood in Limerick. It is about the hardships that he himself, his mother and his siblings had faced there, and how there American accent had affected their lives in Ireland. He started the story of his life, with his father and mother getting married in America,and then how they were forced to move to Limerick, where he, Frank had spent his childhood. He had aptly described the problems that his mother Angela and he had faced because of his father, a drunk, and how they had led their lives in those trouble times. The book is good, but the most surprising thing to me in it was the mention of India, or rather using India as a benchmark for comparing any lowly thing. Let us look at the following lines, where a character is talking about fleas - "I have to be careful standing here for if one of them gets on my clothes I might as well invite his (fleas) whole family home. They multiply faster than Hindus" But, I may only say that author must have also considered the multiplication rate of his family, for he himself has 6 brothers; and this in fact is not the only case but , there were five or six similar instances where comparison is made to India or Indian people I am a bit choosy about reading books, and to be very frank I chose this book only because of the following comment- "Ever once in a while, a lucky reader comes across a book, that makes an indelible impression, a book you immediately want to share with everyone, around you.....Frank McCourt's life, and his searing telling of it, reveals all we need to know about being human" But, frankly speaking, I didn't feel anything like that, the reason for that may be his style of writing, the language is weird, not actually weird but one must also say great, as author has tried to do justice with the Irish accent of English. Moreover, a little part of the book was all about church, communion..., and that had really bored me. On the whole I would say that, if you have patience you can read this book, or else don't pick this up. MY BOARD-6.5 Grands My Board is a rating, out of 10 Grands,given solely by me- 1to 3 Grand- don't even think of touching the book. 4 to 5 Grand- Boring, and unnecessarily stretched book 6 to 7 Grand- If you have patience, you can read the book 7 to 8 Grand- You will like the book 8 to 9 Grand- You will love it. 9 to 10 Grand- You will love reading it's every single line, para, page. Most of the Westerners have such weird ideas abt India. According to them every Indian is poor, living in slums ...pray to idols.. We worship snakes & elephants... To my knowledge we worship nature & we have Gods depicting all animals, why they are fascinated by only two things is still a mystery! Nothing can change their outlook... Movies which show the real us dont run gud and those which run like the "Slum Dog Millionaire" exaggerates! yeah you are right about movies..